Each title has an introduction, specially commissioned for the series. 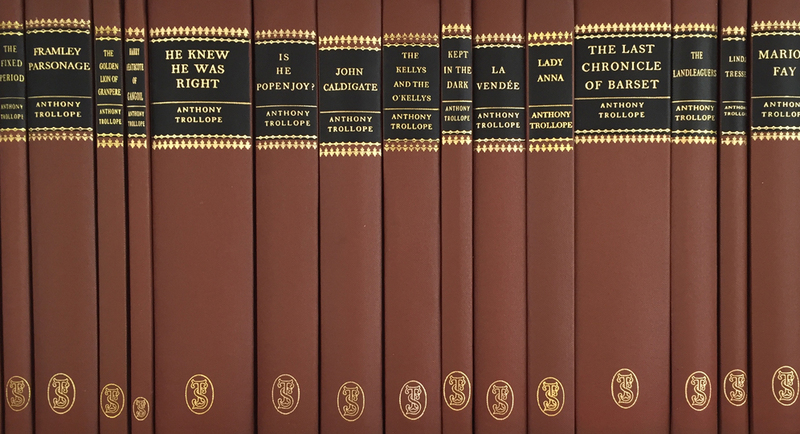 Introducers are diverse – reflecting Trollope’s enormously broad appeal – including Joanna Trollope, Mary Warnock, Antonia Fraser, A N Wilson, P D James, Robertson Davies, Victoria Glendinning, Maeve Binchy, John Mortimer, Enoch Powell, Roy Jenkins and Asa Briggs. The page format is medium octavo (9″ x 5 314″). Original illustrations are used in The Society’s edition only where they occurred in the first edition. Artists represented include Sir John Millais, ‘Phiz’ (Hablot Browne), and Frank Holl R.A. The aim is to present a series designed to the best library standards which will stand constant reading over many years.